It’s been a while since I regaled you with weird, true tales. What could be more interesting than the history of English turkeys?! Nothing, I daresay! The post is by penandpension.com, the link below. No, this is not a bizarre idea for a new Christmas panto! Just a plain, factual statement of what took place in Norfolk in Georgian times. From the late 16th century, thousands of geese and turkeys were walked the hundred miles from Norfolk to Leadenhall market in London each year. The journey would take three months and the birds wore special leather boots to protect their feet. Geese wouldn’t allow themselves to be shod (hence the contemporary phrase “to shoe a goose” for something difficult), so their feet were dipped in tar and covered with sand. The Magic of Spain, Now with Added Babies! In six short weeks I will be returning to Spain, a country I have visited the most in my European travels (just three times, but hopefully more in future years). What better time could there be for reflection and daydreaming? Think of it … Spain. The very name brings to mind exotic ancient lands and the far-away echo of guitar music. And more, following on the warm, orange-scented breezes. Whirling flamenco dancers. Sunsets over the ocean. Tapas in picturesque cafes. Baby-jumping in the plaza. Yes, it is so. Jumping over babies is apparently a thing in a certain part of Spain. Which brings it squarely into Hiccups in History territory. This series of blog posts celebrates weirdness throughout history. Because my spirit animal is some sort of weird turkey/horse/panther hybrid. Or something. Anyhow. This bizarre–dare I say infantile–event takes place in mid-June each year, just after the Feast of Corpus Christi (the blood of Christ). In the north, near Burgos, lies the village of Castrillo de Murcia. The festival of El Colacho dates back to the early 17th century, when good and evil come alive in what may have its roots in the fusion of Christianity and earlier pagan traditions. Men dressed in red, with yellow masks, dash through the streets impersonating the devil. They insult villagers and whip them with horsehair. All is fun and games terror and hysteria until the sounds of drums herald the arrival of black-clad good guys–atabalero–who drive out the evil. But first babies born the previous year are laid out on mattresses in the street. As the “devils” leap over them they are thought to absorb the infants’ sins, an act which protects them from future misfortune. The villagers hurl invectives at the devils, thus securing for themselves a reprieve from bad luck. After a quick spritzer with rose water, the babies are rescued from the mattresses and all is right with the world again. The Catholic Church frowns on the festival, but it continues nevertheless, drawing a growing number of curiosity seekers. Alas, I will not be around for any baby-jumping festivals when I next travel to Spain. But unusual places appear on the Camino de Santiago as well. During my 2015 trip I came across a village that honors sacred chickens. Who knows what I will encounter this next time? “The Baby Jumping Festival.” Atlas Obscura. Retrieved January 22, 2018. https://www.atlasobscura.com/places/the-baby-jumping-festival. Khan, Gulaz. “Look Inside Spain’s Bizarre Baby Jumping Festival.” NationalGeographic.com, June 16, 2017. https://www.nationalgeographic.com/travel/destinations/europe/spain/el-colacho-baby-jumping-festival-murcia-spain/. Behold, gentle reader! Here you witness the start of an intermittent series of blog posts designed to feature those subjects that are dear to my writerly heart. Namely, the quirks of history, which is called, descriptively enough, Hiccups in History. The very first of such posts is a reblog by TwistedSifter. It’s just too good to pass up. More hiccups to come soon! Dun Dun Dun. New Release Day! At last, the day has come! What, you say? The Second Coming is upon us? Nay! My romantic historical wackadoodle novelette is here! Surely that’s of equal import … ? Err. Let’s just forget I wrote that. Anyhow, this novelette is 10,000 words of icebergs and explosions, potions and provocations. Don’t wait to get it! Seriously. The end might be nigh. Today is the day for the cover reveal of my novelette! I’m flailing around like Kermit the Frog. What do you think? Does it look like the best thing in all of creation, everywhere, at all times? (Errr, okay, maybe I got a little carried away there). My cover designer is Yoly from Cormar Covers, who is not only talented, but also reasonably priced. Please share it on your blog, Facebook, Twitter Instagram, what have you. Links are below! The story’s release is one week from today, July 5th. Because killer seals and subzero ice storms and aren’t the only danger in Antarctica: a enemy spy is on the loose. Florance has been ordered to choose between queen and country and her heart. Because penguin is off the menu now–and murder is its replacement. Be notified of the release! Subscribe to Xina’s mailing list here! Author Xina Marie Uhl lives in sunny Southern California with her husband and assorted furry and scaly pets. The setting of her first novel, NECROPOLIS, has been heavily influenced by her interest in ancient history. She holds both a BA and an MA in history. 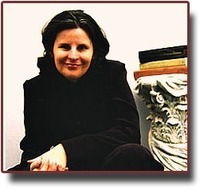 In addition to fiction writing, she teaches college history courses and writes educational materials. When she isn’t reading and writing, she enjoys hiking, photography, and planning new travel adventures. Yes, I am resurrecting my blog from the dead. Lazarus, come forth! I am not so sure about this header photo, but it is a bit quirky and has books on it. Plus it gives the illusion that I look like the woman on the bed, which I most assuredly do not. Now don’t tell me that rampaging monkeys released by a baboon and subdued by alcohol doesn’t give you a chuckle. 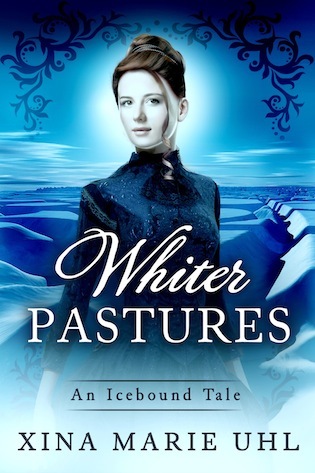 I came across this while browsing for material about my latest Work-in-Progress, an early 20th century gay romance set in remote Alaska. Stay tuned every Monday for something equally enthralling. Err … I hope! I do? This was news to me. Though upon reflection, Dave was probably right. 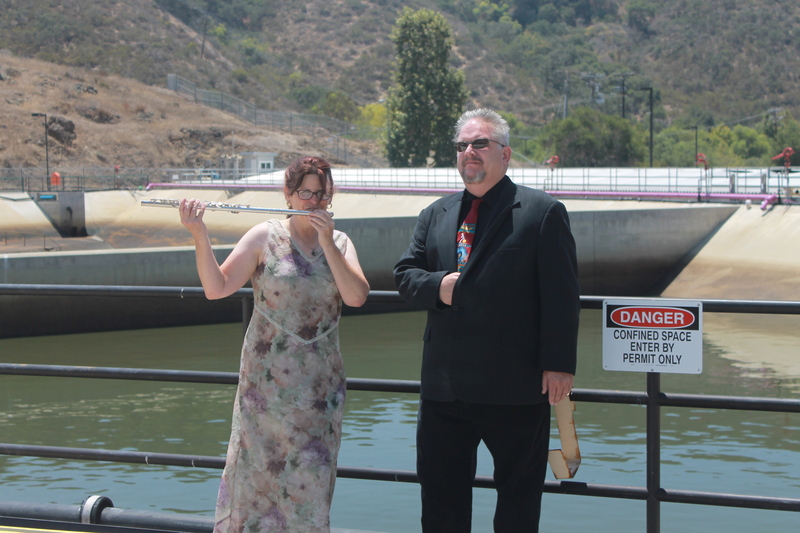 In that same vein, Dave and I participated in GISHWHES for the second time. This time we managed to talk our 18 year old nephew into joining us. And you know what? The whole experience was … weird. gishwhes believes that “normalcy” is overrated and that true “living” can be found hidden under the rocks of community artistic creation, acts of artistic sublime public performances, and random acts of kindness. More importantly, we are all artists and have gifts for society no matter what our capabilities or talents. And most importantly, we at GISHWHES want you to know the most important thing we’ve learned in the past four years: it is almost impossible to make durable clothing from cheese. Now that you are practically frothing at the mouth in anticipation, here are things that Dave, myself, and our nephew “accomplished” during GISHWHES 2015. When I called our local wastewater plant to schedule a tour the following occurred. #41. IMAGE. The cats are coming! 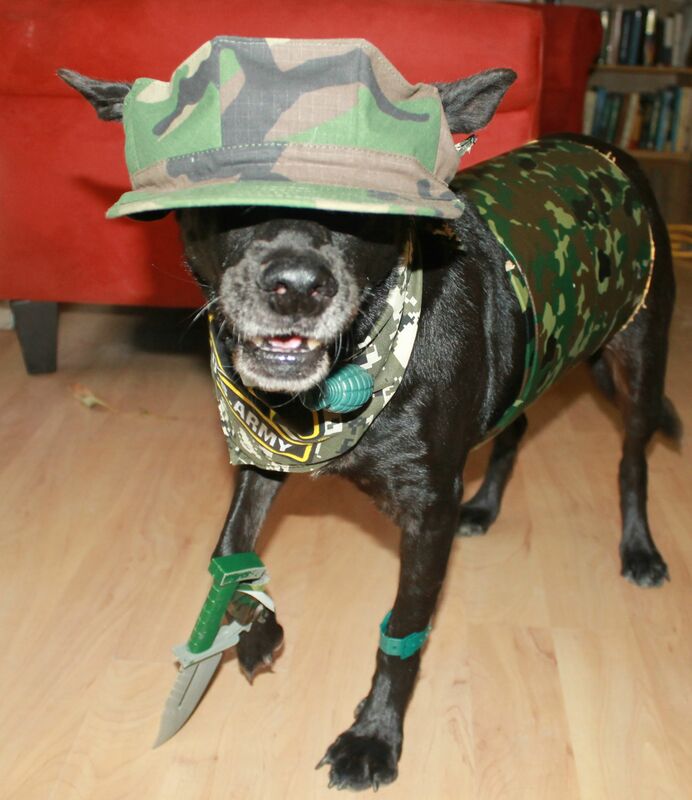 Prepare your dog for battle. Outfit him or her with armory, weaponry, cutting edge laser gear – whatever it takes to create a canine of mass destruction. Here you see our intrepid battle hound, Misha. Watch out or she might stab you good. #44. IMAGE. 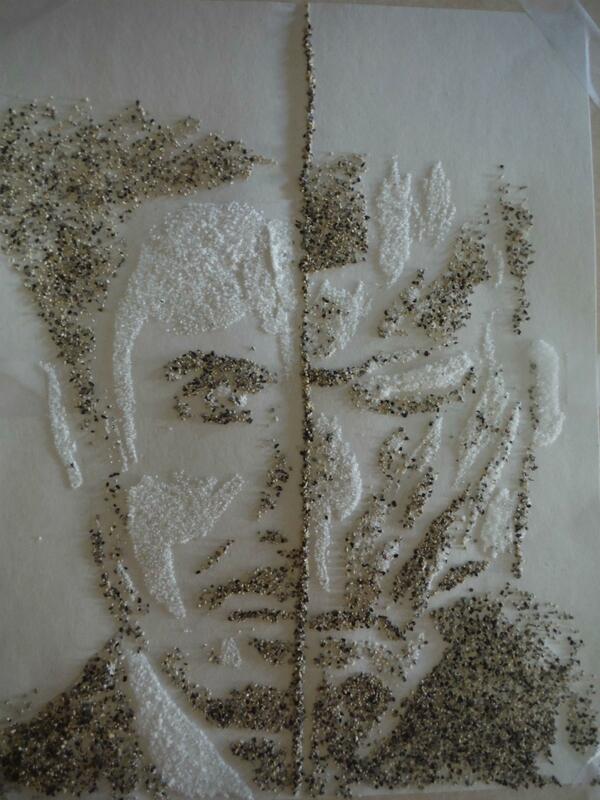 Let’s see a portrait of Robert Downey, Jr. or Ironman made entirely of salt and pepper. Tweet it to him (@robertdowneyjr) with @gishwhes in the tweet. SUBMIT a link to the image to us, NOT a link to an image of the tweet – but you must tweet it to him for your image to count. Our cherub-faced nephew Jacob created this one. Truly, he has a future in condiments, does he not? #79 IMAGE. 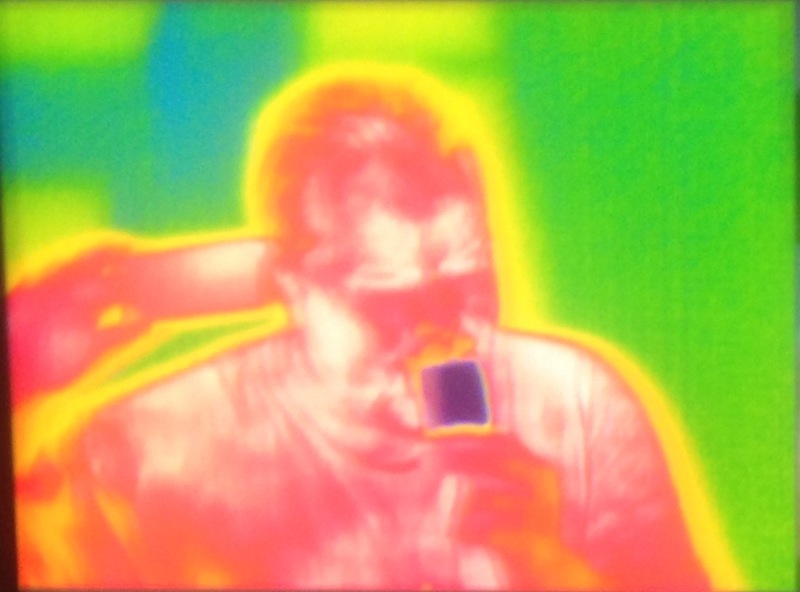 Take an infrared photo of a popsicle in your mouth. This is Dave with his phone held up to his head, not a gun. #108. VIDEO. (Time lapse this down to 14 seconds.) Lay your bets, and time lapse a snail race from the starting gun to the finish line. This one took a surprisingly long time to completely. Well, okay. Maybe not so surprising now that I think about it. #110. VIDEO. Use a cutting edge 3D printer to 3D print your representation of the 4th dimension. Dave is the creative mind behind this one. #112. IMAGE. 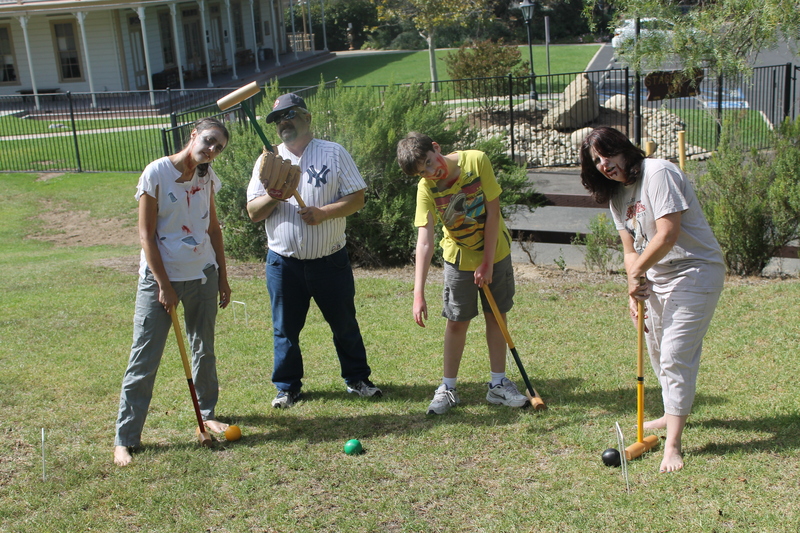 Let’s see a refined game of croquet on a public lawn of a historic site. All participants must be zombies. We had some help with this one, as you can see. The other park-goers may never recover from the horror we produced. #132. VIDEO. Make an action movie trailer. The main star: a pot roast. This is also Jacob’s creation, and I am so impressed that I expect this boy’s film to be outselling Steven Spielberg at the theater any day now. Kickstarter for the actual film, anyone? Keep your eyes pealed for next year’s scavenger hunt. Do yourself a favor and stock up on caffeinated beverages and courage, though. You’ll need both. 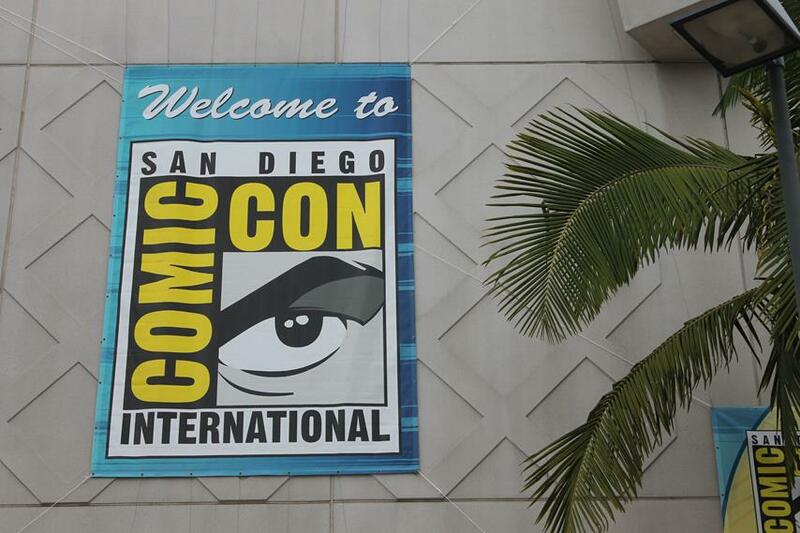 Well, San Diego Comic Con is over now, sadly. The cosplayers have un-cossed. The street preachers have disappeared. The flyers, leaflets, and business cards littering the avenues have been swept away. It’s bittersweet, in a way. Before you forget about it entirely in the rush of everyday life, however, linger for a moment longer. 1. Yes, you can save money on parking. Parking fees next to the convention center are astronomical. Fees at the closest hotel rooms are almost as bad. It’s not all that easy to get. So what’s a poor nerd to do? Park further away and take the trolley or a cab. Joe’s Auto Parks is 12 blocks away and only $5 for the whole day. Well worth the walk (http://joesautoparks.com/san-diego/). Or park at the airport for $13 a day (economy lot) and take a cab in. Edited to say that you can also park at Qualcomm Stadium for free and take the trolley in. An even better deal! 2. Your luggage does not have to be heavy enough to dislocate your shoulder. Before you leave next time, pack light and make sure you have lots of extra room for the inevitable crap you will accumulate. The swag, people. You know you have to have it. And you really need room for it. T-shirts. Posters. Gigantic bags. Buttons. Paper hats. Horse masks. Whatever, dude. 3. Take the train if you are coming from LA or other points north. Seriously. It’s so much better than driving could ever be. I vowed to take the train after sitting stuck in traffic on the freeway off-ramp for 45 minutes. But you should be aware that you might have to stand if you board at an extra busy time. Comic Con often coincides with the opening of Del Mar, the race track. There’s nothing like riding the train next to cosplayers and wannabe Southern belles in huge floppy hats and frilly dresses, their flawless, manicured nails clutching a bottle of vino in disguise, and their loud shrieking laughter proof that they’ve already imbibed. 4. Watch your badge. They can and do fall off that crappy plastic badge holder and then you’re faced with big problems. If you can’t find it via lost and found at badge registration, you’ll have to pay daily fees to replace the badge. 5. Support independent writers and artists. 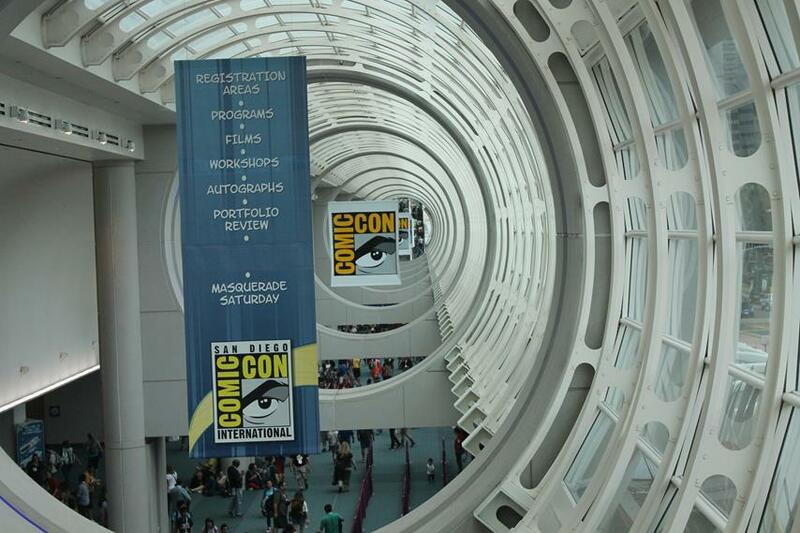 The Exhibit Hall is a feast for the senses, like all of Comic Con and as such it can be completely overwhelming. Don’t let the loud moneymakers have all your time and attention, though. Visit Artists Alley or the Small Press tables to find unique books, stories, and artwork and know that you are supporting the efforts of starving artists directly. 6. Team up with friends. First of all, it’s really easy to start chatting with people next to you when you are waiting in 6 hour lines. I’ve made two good friends doing just that. Friends are also extremely helpful when it comes to purchasing badges and sharing hotel expenses. Plus, they are overall fun. 7. Avoid the crowds by entering the convention center through the back door. What? Is it possible that you don’t have to struggle down the maddening hordes at the front of the convention center in order to get inside? Yes, my friends. It is true! For I myself have used this little known entrance this very year! Don’t feel bad, though. I only just discovered it despite the fact that it’s so easy to find. Just look at the map and plan out your route. Because so few people use it, though, it seems too good to be true. Forge on and ascend those stairs, though. At the end you will find your reward. 8. Hydrate, hydrate, hydrate. Sure, the temperature may only be in the 70’s, but the humid ocean air and the sun beating down on you as you wait in 5 mile-long line after line may heat you up and dehydrate you more efficiently than a commercial pizza oven. Is your only recourse to shell out $4 for a teensy-weensy bottle of water? Nay! And again I say, nay! Bring your own water bottle and slink to the back of the big halls where you will find water stands. Also of considerable help are electrolyte pills, which you can buy online or at your local health food store. They contain the electrolytes that Gatorade has but without all the added sugar. 9. Sleep short but sleep well. A long restful night’s sleep is too much to ask between rooms shared amongst 14 people, sleeping on the sidewalk in line, and nonstop parties. However by making use of ear plugs (for those 13 snorers in your room) and eye masks (to blot out every last scintilla of light) you will sleep deeply during those precious few hours, and away (mostly) refreshed for another day of fun. 10. 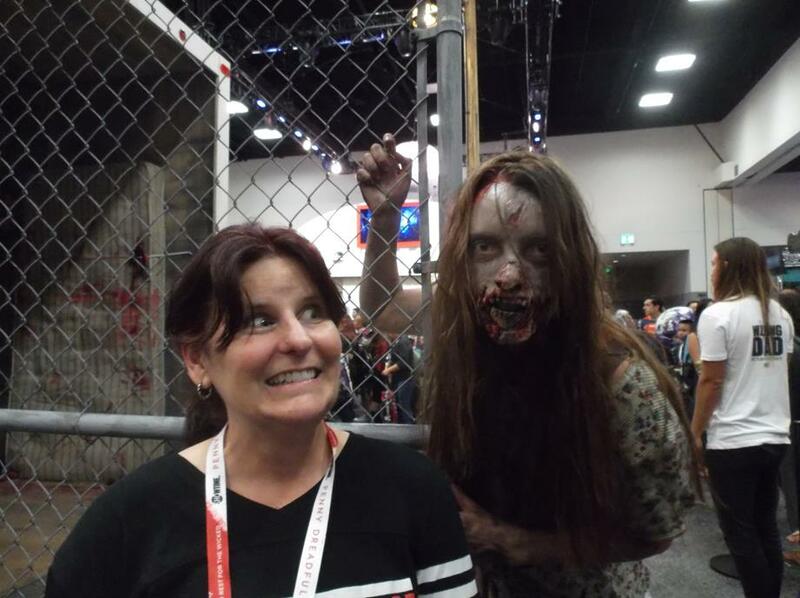 Don’t give up on Hall H. This is what I did a few years ago. I saw the hellacious lines that stretch on not just for one night but two in order to get into Hall H for Saturday’s program. The new wristband policy, despite its flaws, does cut down on the need to sleep in line. You may still have to wait a long time but during certain days – Thursday and Sunday, I’m looking at you – you can walk right into your panel within an hour or so of its start. It doesn’t seem possible, but it’s true. I did it myself. And just for the record, I plan on being there for my 10th Comic Con next year, when I will perhaps discover even more tips to enhance the crazy free-for-all that we all love so much. What do you think of these tips? Do you have any to add? Comment below! San Diego Comic-Con! It’s been there for quite a few years now. More than 40, I believe. Even the buildings get in on the action. You’re never too young to cosplay. Felicia Day is a sweetie. Wil Wheaton has grown up, for sure! Ah, love the artfully tousled hair. Yeah, I just had to include this guy again. The challenging monster dude is a cosplayer too. 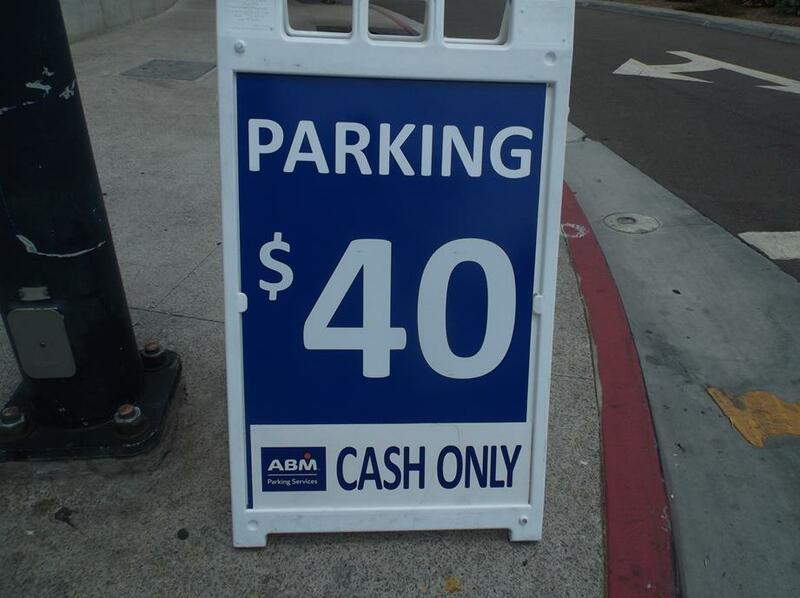 It can be VERY expensive to park in the Gaslamp District. Camping out on the sidewalk to get into Hall H where the big stars go.